Walking the World in Wonder…Wonder I Say! Right now, I’m writing this at home, trapped inside because of yet another ice storm. As I hear the clicking noise of ice hitting the ground, I find it hard to imagine spring will ever be here. However, I know that it will, and with it will come all the vibrant hues of the flowers, trees, and herbs that only a winter followed by spring can bring. 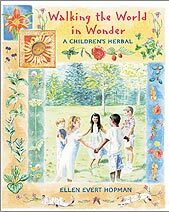 I’ll have to ramp up all the allergy medications I take, but also it will be the appropriate time to give a certain little girl I know the book “Walking the World in Wonder” by Ellen Evert Hopman. I found the existence of “Walking the World in Wonder: A Children’s Herbal” a pleasant surprise. It never occurred to me that such a book would exist. I was given the chance to look it over for review and jumped at the offer. I was rewarded with a wonderful book. The back cover says the book is appropriate for children ages 5-10 years old. Although I will readily admit that as a novice to the world of herbalism this book was at about the right speed for me too. The book highlights 67 plants, ranging from barberry to witch hazel, conveniently divided up by season. Each plant introduces itself to the reader (such as “I am barberry. I am found in open fields and sometimes in people’s yards.”) and has a large, clear, full color photo of the plant. Each entry clearly describes the plant, provides details as to harvesting, and examples of traditional uses of the plant in herbalism. All that was awesome, but what really impressed me was that Hopman offers advice to parents and teachers as how they can utilize “Walking the World in Wonder” as a fun, educational tool. Hopman discusses safety, “green etiquette”, and provides a checklist of all the plants so as children find them they can check them off the list. I can’t wait until spring when I can give “Walking the World in Wonder” to a special little girl in my life. By the way, I’m pleased to tell you that Ellen Evert Hopman, past Magical Buffet contributor and author of “Walking the World in Wonder”, will be sharing her thoughts on trees with Magical Buffet readers on a fairly regular basis. To learn more about her and her writings, click here.